This is the first official post for the Twin Cities Naturalist Blog. The blog is a companion to the forthcoming Twin Cities Naturalist Podcast. Silence. This is the sound of love in the woods in February. It is a dark evening in a frozen landscape with the moon hidden behind a winter blanket of clouds. My snowshoes crunch through the bare woods of maple and oak. The sound doesn't seem to travel far. The porous snow absorbs and deadens sound. When I stop, it is silent. There is no wind tonight, there are no animal calls, there is nothing and it is this absence of sound that tells me something is happening. Back in the first week of December, Ron Lawrenz, our Director at the Lee and Rose Warner Nature Center excitedly shouted "owl!" from his office. His corner office view of the hardwood forest gives him a constant reminder of the reason we do what we do. Out of the corner of his eye, he spotted movement in the woods. He looked up just in time to see a barred owl alight on a small tree about 125 feet away. He struggled to point it out to us as we huddled at the windows but it was difficult to discern, owls are masters of camouflage. Finally, it moved and we watched it fly closer. It landed on the edge of the woodland clearing the building sits in. 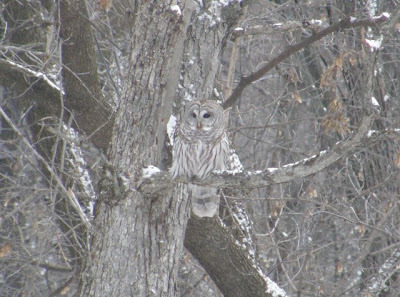 The tree it chose was the same tree we had seen a barred owl in last February. Could this be the same owl? Over the following months, the owl moved about the forest searching for a nesting site and calling out for its mate. We could hear the owls in the woods, their voices threading through the bare branches like auditory shadows. They sang as we walked to our cars in the evening surrounded by the early darkness of winter. The barred owl calls out "Who hoo hoo hoo, Who hoo hoo HOOoo." The call is commonly described as the questions, "Who cooks for you? Who cooks for you-all?" Sometimes, our female captive barred owl calls back but she's injured and not allowed to fly around the woods with the other owls, nor is she free to find a mate. That doesn’t stop the occasional confused male from perching near her enclosure and hooting to impress her. As I stand in the woods this February evening though, there are no hoots. There's only the sound of snow crunching lightly under my shifting feet and the quiet rhythm of my labored breathing. The silence speaks. What I am tempted to say is that Barred Owls are clever, that they fall silent in February with purpose and careful thought but this is ascribing too much human thinking to an evolutionary adaptation. They are silent in February because there is an evolutionary advantage to doing so. They have already mated and they do not hoot because they are incubating eggs. Now, around Valentines Day, is the time for silence. They do not want to give away the location of their precious young-to-be. It seems funny that we have a day devoted to love in February and the origins of tying romantic love to the pre-existing day celebrating Saint Valentine are far from clear. What I do know is that February is a time of deep cold. Perhaps that's why we feel the need for a day devoted to something that warms us. It reminds me of the ancient rituals of bonfire lighting on the solstice. Create that which is missing. Kids give out cards with hearts and cherubs, or these days, Sponge Bob Squarepants and Hannah Montana but what do these things have to do with love and the season and bringing warmth? We need valentine's cards with owls on them. Owls pair bond for life. They choose one mate and stick with it. It is in this cold dark month of February that they mate and work their hardest to bring forth new life. That seems like a wonderful symbol of love to me. But why February? Owls nest and mate long before other animals who wait for spring. In doing this, they get a jump start on their food source. The female owl will incubate the eggs for a month and by the time the young owls are ready to leave the nest six weeks after hatching, the rest of the animal world has mated in the more traditional spring and there is an abundance of small critters to eat. Young owls are well fed on the bounty of spring. I stand in the cold silence knowing that there are small white eggs silently being kept warm in a nest somewhere nearby. Snow begins to fall and the collected sound of all those millions of flakes touching down on the ground is a barely auditory whisper. I whisper, "good luck" to the owls and head home through the snow to rejoin my love and celebrate warmth on a cold winter's night.